Big Man continues his bloody rampage of vengeance after having a serious setback. He seeks help from an old ally and we return to the deadly jungles of war. 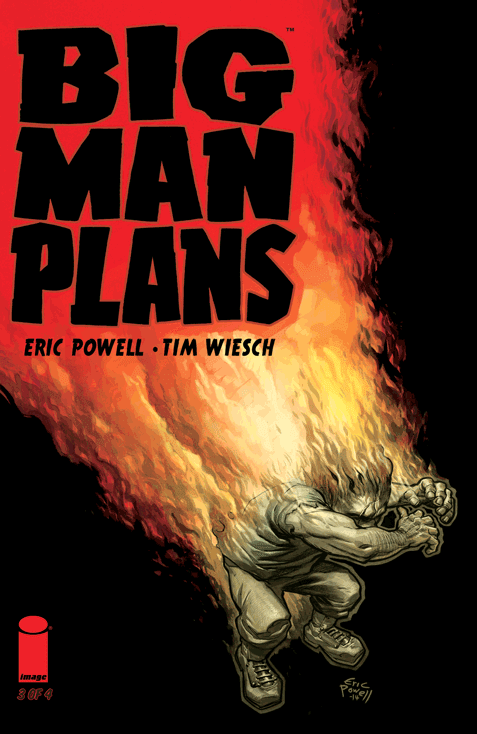 Eric Powell and Tim Wiesch are turning out one of the best mature rated comics in the business with Big Man Plans #3 (of 4). The series is a visceral experience in sheer unforgiving revenge brutally displayed with the precision of a Quentin Tarantino movie. I've made the comparison to movies like Kill Bill and Death Wish before, but the Big Man in Big Man Plans isn't just a mindless killing machine. Powell softens our underdog hero with a backstory that explains more than justifies his extreme actions. A lifetime of being bullied and ridiculed after losing his strong and adoring father, Big Man finds an outlet for his rage in a place that would welcome it - the Vietnam War. He finds he has an aptitude for killing and when things were at their most chaotic he stood up to the enemy even if that enemy was in his own ranks. So Big Man is a man of conviction and always deserved more respect than he got. One person who showed him some kindness was a nurse who healed his wounds as a child when he got beat up by the other kids. He's known some kindness in his life, but now those who hurt him had to pay. Wiesch's art is fantastic. I could go on about his layouts and panel transitions especially in one sequence late in the issue that really brings out the terror of one character, but his greatest creation is Big Man himself. The dwarf takes on different looks and each one is just as menacing as the last one. You can't keep your eyes off him. There aren't too many riveting characters in comics like Big Man. Big Man was the reason I picked up the comic to begin with and I'm glad I did. Big Man Plans reminds me of First Blood with the war vet pushed to extremes. The line, "they drew first blood," takes on a deeper meaning considering all the emotional and physical scars within Big Man. The book may have a primal gratuitous penchant for violence from a sociopath, but Powell somehow tethers it to the broken soul of Big Man. Anyway, Big Man is geared up for a final showdown leading to the conclusion of the miniseries. It's worth every penny to own the series either now or as a trade paperback. Big Man Plans demands to be read.